(CNN) -- Olympic hero Michael Phelps was suspended from competitive swimming for three months on Thursday -- just hours after one of his sponsors announced it would not renew his contract after a photo surfaced of him smoking from a bong. 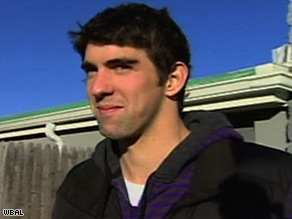 Michael Phelps admitted "regrettable behavior" after a photo of him smoking from a bong was published. USA Swimming, the nation's governing body for competitive swimming, said it was withdrawing financial support for Phelps and barring him from competition during the period of his "reprimand." "This is not a situation where any anti-doping rule was violated, but we decided to send a strong message to Michael because he disappointed so many people, particularly the hundreds of thousands of USA Swimming-member kids who look up to him as a role model and a hero," they said in a statement. "Michael has voluntarily accepted this reprimand and has committed to earn back our trust," the statement continued. Earlier Thursday, Kellogg Co. said it will not renew Phelps' advertising contract. "Michael's most recent behavior is not consistent with the image of Kellogg," company spokeswoman Susanne Norwitz said. "His contract expires at the end of February, and we have made a decision not to extend his contract." Norwitz said Kellogg's relationship with Phelps began with the company's support of the U.S. Olympic team. Kellogg did not renew its sponsorship of the team when it expired in December, she said. Phelps admitted "regrettable behavior" on Sunday after a British newspaper published the photograph. The tabloid News of the World showed Phelps using the bong during what it said was a November party at the University of South Carolina in Columbia. The Richland County, South Carolina, sheriff's office said Tuesday it was investigating whether Phelps smoked marijuana on the school campus, adding it would file criminal charges if it determined he did. Both university police and Columbia, South Carolina, police said they would not pursue charges, according to The State newspaper in Columbia. It was unclear where the party took place, the paper said, or whether it was on campus. "I can learn from it and try to make my life better than it has been in the past," he told WBAL. "I think it's hard to really be ready for any of this. But I've actually been able to talk to a lot of people, and lot of people that have been in my shoes in other sports, and I've been able to get their perspective and just talk to them a little bit, and that's been helpful over the last few days," Phelps said. In a statement released Sunday, Phelps, who won a record eight gold medals at the 2008 Olympic Games in Beijing, China, said: "I engaged in behavior which was regrettable and demonstrated bad judgment." "I'm 23 years old, and despite the successes I have had in the pool, I acted in a youthful and inappropriate way, not in a manner that people have come to expect from me," he said. "For this, I am sorry. I promise my fans and the public -- it will not happen again." iReport.com: Should Phelps have been suspended? The U.S. Olympic Committee also issued a statement that said in part: "Michael has acknowledged that he made a mistake and apologized for his actions. We are confident that, going forward, Michael will consistently set the kind of example we all expect from a great Olympic champion." In 2004, Phelps was arrested on charges of driving under the influence in Salisbury, Maryland. He pleaded guilty and was sentenced to 18 months probation. He also issued an apology after that incident. Phelps is one of 12 Olympic athletes who pledged to "My Victory," an initiative launched last year by the U.S. Anti-Doping Agency aimed at keeping competitive sports clean.